Very disapointing! Very safe and no creativeness what so ever! Which is what most designers are doing these season! I love the sandals.Overall the collection is pretty typical for Hermes.Luxe and non challenging for the uber wealthy who desires the Hermes stamp of good taste.It is a little too refined for me.Its amazing for what it is and Im sure it will sell well. I need all of the pictures and possibley the video from the hermes show , 2003 which was in the Institut du Monde Arabe .. I think it's not that bad, cause it's Hermes, which is imo very classic. When it's JPG, then I'll disappointed too. Do you know where i can get my hands on them pictures ? sorry rmcgbp01 I don't know it either. at initial glance, this looks like stuff i can find from h&m and zara. it's by veronique nichanian right? i don't mind it. it's very 'ordinary'. it fits the bourgeois thing hermes has going on though. While her colleagues – including Martin Margiela and Jean-Paul Gaultier – have come and gone, Hermès’ longtime menswear designer Véronique Nichanian has been going strong for some 24 years and is now also in charge of the house’s shoes, bags, silks and accessories for men as artistic director of the Hermès Men’s Universe. She sat down with MANIFESTO to talk about her childhood and what keeps her at Hermès. When Véronique Nichanian starts talking about fabrics, it’s hard to get her to stop. As a girl growing up in Paris, she’d be out buying cloth every weekend, and now, when creating for the Hermès man, choosing exclusive fabrics and designing is her favourite part of the process. “The fabric is the starting point because everything is possible. I’m still like a little girl in front of a patisserie. When I look at fabrics, I want everything – it’s difficult to focus. This is the first exciting point,” expresses the French designer. “In my work, there is no routine. Everything is different every day; each season is different. It’s fantastic. The runway is very exciting because you have all the work of the team over the past six months and, in just 10 minutes, you have to focus on what you want to express.” It is precisely this adrenaline that has kept her at the French luxury house for 24 years (making her one of the industry’s longest-serving creative stalwarts at a fashion house), after Jean-Louis Dumas, the late chairman of Hermès, had handpicked her in 1988 to revitalise his company’s slumbering menswear business. With the freedom to do exactly what she wants – all within reason, of course, for Hermès is neither flashy nor loud, shunning big statements in favour of tiny details that only wearers will notice – she almost feels like she’s heading up her very own label: the house of Véronique Nichanian, if you will. In light of her 36 years of menswear experience, one may wonder why she never started her own line, but she sees no real need for it as she doesn’t have any restrictions at Hermès. If something isn’t done right, she has the luxury of starting over, backed by a small army of thousands of craftspeople, of course, from the special order workshop located in the very same Rue du Faubourg St-Honoré building as her design studio and silk facilities in Lyon to custom shirt-makers and fine leather artisans in Pantin, located near Paris. Her husband may be a motorhead, but she’s afraid of motorbikes herself. So to relax, she reads or goes to the cinema, spoilt for choice as she lives in the lively Parisian district of St-Germain des Prés. Her other big passion is travelling, expressing a fondness for architecture and big cities like Tokyo, New York and London. Prior to Hermès, Nichanian had worked with Italian couturier Cerruti for 12 years, eventually co-managing the men’s collections, after having graduated from the École de la Chambre Syndicale de la Haute Couture in Paris in 1976. It was easy making the switch from studies in women’s couture to working in men’s ready-to-wear. She explains, “When I finished school, Nino Cerruti was looking for an assistant. I thought that it would be interesting to do men’s fashion for one or two years. And now I’ve been doing menswear for over 30 years. What I’d learnt at school above all was how to make a well-fitting garment. So I didn’t have to relearn everything. What was very interesting about working with Nino was that he used to have, and still has, a fabric factory. I learnt everything about fabrics there.” One of the few women to design clothes for men, she emphasises colour and the blending of traditional and innovative materials – qualities characteristic of Hermès’ casual chic identity. She mixes beautiful fabrics and exclusive skins that are at the very root of Hermès with materials featuring special new finishes to produce a téléscopage (overlapping) effect, uniting tradition and modernity, as she brings together centuries-old craftsmanship and the latest technological advances. Her clothes are at once strong yet sober, luxurious yet stealthy, elegant yet easygoing, even pairing suits with tennis shoes. As reflected in her combination of traditional cuts and bold colours or prints with a few quirky touches, her designs are a fusion of the 1930s with its simplicity and clean lines, and the 1970s with its energy and craziness she says, even comparing them to the difference in architectural styles of Tadao Ando and Frank Gehry. With her decades of experience in the pursuit of excellence in fabrics, you name it, she knows exactly where to find it: linen, cotton, wool, mohair, etc. Or she’ll create a new fabric altogether – an area where she demonstrates the most innovation – like croco chiffon that transforms matte crocodile into a soft fabric suitable for a shirt or T-shirt, a nylon-like leather windbreaker, a pinstripe jacket concealing rainproof neoprene or a wool jacket made water-repellent on the yarn, regularly working with manufacturers to create special materials exclusive to Hermès. While she might be chatty and possess an acute sense of humour, Nichanian has a side that is also simple and straightforward, much like her designs, where the real expression is in the fabrics and details. With a humble discretion that is seldom utilised in today’s fashion scene, she introduced Hermès’ first menswear-only store in New York in 2010 along with a bespoke service covering everything from suiting to knitwear. Even with France’s highest decoration, the Legion of Honour, under her belt, she has managed to stay under the radar, preferring her clothes to do the talking. So who exactly is the Hermès man for whom she creates? She reinterprets the classics with continuity in mind, with each season evolving from the last, so a man can always find a sweater or trousers from her new collection that works with a previous one, her clothes being slow to date. While they may be mixed and matched, each item of clothing may be viewed as an individual object, a functional and timeless signature piece in its own right. I hadn’t realized how many years you’ve been with Hermès—21, isn’t it? Yes, I don’t count. Yes, it’s a long time, it’s a long story—a nice story. A love affair, almost. Still happy. You’ve seen the menswear business change enormously in that time. Oh, yes. The business is changing, and men generally speaking are changing. It’s more fun. Everyone’s more interested in the men’s business, how men dress. Do you feel like it’s changed the way you approach design? Not at all. I’m still doing the same thing, the same approach, still considering in the same way the men’s universe and trying to propose things which are right for now—modern and exclusive at the same time. How has the customer changed? You’re now dealing with a business that’s much more global than the one you entered into. It’s a big business now. But generally speaking, that’s right that men are much more self-confident in the way they want to dress, and feel much more their own personality. They look at the magazines, of course, but they know themselves much more; they want to express their personalities. They’re less focused on having a suit to be serious. [They want] to have their own mix, to choose. They’re much more aware of what different [brand] names propose—different cut, different feelings, different philosophy. I think it’s a question of philosophy when you choose a house more than another one. You mention modernity as a key part of your philosophy. How so? Modernity for me is mixing innovation and tradition in the same time. This is the definition of the Hermès house from the beginning, but this is also from my past. That’s why it’s a long story between Hermès and I. Because I feel comfortable playing with the beautiful material—the most exclusive leather, or crocodile, or cashmere, or the most beautiful linen or cotton…And also to play with the innovation in terms of fabric, yarn, mixing those things. How do you work with the ateliers to innovate with materials? If I should define myself, [it is that] I love material and I love fabrics, since the beginning. That’s why, when I was a child, I wanted to do fashion. I love feeling those things, and I love the emotion you can have with a rough tweed, a rough Shetland, a beautiful cashmere, a sweet leather. I love that. I’m an emotional person, and I try to express the way I design clothes, the emotion of the rough and the soft—different feelings. I love going to the factory directly, working with the technicians. I think when you’re in front of a technician, you say, I was thinking of doing that, a stretch linen. He says, No, it’s impossible, because a stretch is… And I say, But if you do that way… It’s like a game! Because I’m stubborn. I know that I want to imagine something new. I’ll do a pinstripe jacket but I want to see it rain-proof, because my husband is doing motorbiking and I want him to be chic and also rain-proof, so I do a neoprene jacket [mixed with] flannel. Now there is neoprene everywhere, but I’ve done that for years. But I don’t think of you as being a designer who follow trends, or even sets trends. To me, your work seems much more classic. I don’t know what you mean when you say my work is “classic.” I don’t want to be fashionable because for me, fashion is something more…éphémère. I like to play fashion, to buy something not too expensive, and after one season, OK, I don’t like it anymore. I want that my clothes, people who wear them, to like them for a long time. I don’t want to [exaggerate] the fashion, because it’s another game. I don’t do fashion, I do clothes. For me, it’s really different. I want to consider each [piece of] clothing like an object. “Classic” has become a cliché. It’s like “luxury.” It means many things, and not anything anymore. When you say all the brands do luxury, or everybody’s a star…I prefer to talk precisely. I’m a person who is doing work very precisely. I prefer to talk about clothes. It’s another chemin, another route. It’s my route, for over 20 years. I don’t want to trot out another cliché, but I do want to ask about the word “luxury.” For me, luxury has gotten very cheap, but Hermès has a good claim to be the true luxury. I’m talking about quality. I don’t know what luxury means—it’s very subjective. In France, we have so many brands who say, “oh, it’s luxury.” For me, let’s talk about quality. But in terms of quality, one of the things I like about Hermès is that you have a way of treating quality quite lightly. It doesn’t feel too precious. This for me is the point of the modernity. The way you consider mixing things together and playing them together. It’s important, it’s a new way to dress. If I have to define the modernity of the clothes today, it’s légèreté—lightness. In spirit and also in reality. My father used to be a very elegant man, but when I see his suits now, they are so heavy; the construction of the suit was very well done, but so old-fashioned. So let’s consider those things together. It’s not to be serious all the time. A lot of men consider themselves very serious, but you can be very good at what you’re doing and not be too serious. There is obviously a very high price associated with quality, and the Hermès price is quite expensive. Do you feel a need to justify that? I used to say that it’s not expensive but it’s costly. For me, it is a big difference. Many brands choose a €20 or €30 cashmere, but at the end, they arrive at a price that is incredibly high. I feel comfortable with [my] idea. I’m not born from a fantastic rich family. I know what costly means. When I design for Hermès, I can buy and play with the most incredible fabrics. I want the best and I want the best to stand a long time. Do you have any interest in the other side of the market—the inexpensive end, the fast-fashion end? Yes, I love to go to H&M, to buy T-shirts and things that I can use for a summer and then throw away. I think this is very right, and I like to play and mix the things together. For me, this is modern, too. But I suspect there won’t be an Hermès for H&M collection. No, this is not the point. We are talking about myself. This is the modern way to live. If something is right, it could be Hermès, but if it’s right at H&M…the problem is, after two weeks, it’s over, but for two weeks, it was good. How much interaction do you want or need with your customers? Or is it more that you’re proposing something and allowing them to customize, to make it their own? I added a few years ago the services of bespoke, because at Hermès we are doing the most beautiful things we can imagine, but I like the idea of men dreaming of a beautiful coat he’s never found, or the sweater that he wanted to have in incredible colors. I’ve done that for actors and a few VIPs. I want to do that for men who have the money to realize their dream. Have you had any outrageous dreams brought to your door? In my life, I’ve [only] refused two orders. One man, he wanted me to do half a jacket. I said, half a jacket? I’m sorry, I don’t know about that. He wanted to have one side a jacket, the other side, avec des bretelles—braces. I said, I’m sorry. The other was a man who wanted to have a mink pink coat. I said, I’m sorry, too—I think you’ve picked the wrong door. Try somebody else. And yet when I think of your runway shows, some of my favorite pieces are the unexpected ones, the outrageous ones. A few seasons ago, there were amazing leather motorcycle jumpsuits near the end of the show (left). They felt like a cold shower. It was not so special, no? I thought so. Did you sell many? Not a lot, but a few. They put me in mind of fetish objects. And that idea of fetish is, I think, very alive on the women’s side of the Hermès business—the way that women feel about the Birkin or the Kelly. They’re bags that are more than just bags. I’m wondering if you create any other equivalents on the men’s side. Do you wear the men’s collection yourself? You’ve mentioned your father a few times. How did he dress? He was a very chic man. He was a very elegant man, in the old way, but he was not a fashion man. But it sounds like he has influenced you very much. Well, I can talk about my mom, too, if you want. The menswear designer at Hermès on the myth of French style, avoiding trends, and why you can never have too much cashmere. The right proportion and fit are a matter of centimeters—millimeters, really. When you choose clothes that are perfect for you, you feel strong, comfortable, and more self-confident. Style is a question of charm, not nationality. It’s not true that French men have more allure or style than American men. It’s just that they dress with more personality. They don’t follow dress codes, and sometimes they mix things in a way they shouldn’t. Like how Serge Gainsbourg dressed, with his reptile shoes with jeans and blazer and white shirt—that’s charm. In relationships, you must show proof of love and do something passionate. I once had a boyfriend fly from New York to Paris just to have dinner with me. It was very smart. Age is not important. A man, no matter if he’s 20 or 60, can wear a tee and jeans if he has the right body. You should have one watch for the weekend, one for the week, one for suits, one for sport. I love watches. Watches are for men what perfume is for women. They are very personal, and you can wear them according to your mood. Wearing a scarf is about attitude. A man should just wrap one around his neck, maybe two times—but not tightly like women do. It should be nonchalant. Men make a mistake when they follow fashion instead of their own personality or their own body. When they dress in a very slim shape even if they don’t have the right body, it’s all wrong. It’s awful. With my husband, I tell him, ‘Stay yourself and I’ll take care of you.’ He’s the most spoiled man in Paris. You can never have too many cashmere sweaters. There are so many kinds of fits and colors. You should have a lightweight one for summer and a heavier one for winter. Whether you wear darker colors like navy or brighter ones like green or yellow can depend on the way you wake up. The most timeless article of clothing a man can have is a leather piece. An Hermès leather bomber. 2012 was a tough year for fashion designers. Some of the biggest brands in the business — including juggernauts like Yves Saint Laurent, Jil Sander, and Perry Ellis — found their top creative position changing hands. But not so at Hermès, where Véronique Nichanian has overseen men's-wear for the past 21 years. And for good reason. Under her guidance, the French house has greatly expanded its portfolio of luxuriously restrained apparel and accessories for men, so much so that Hermès opened its first men's-only flagship two years ago in NYC and recently announced the launch of a new custom clothing service. Safe to say: Nichanian knows her stuff. So, we caught up with the designer to talk about the state of the industry, the Hermès made-to-measure program, and what she's learned about the male psyche. Esquire.com: How has the customer changed since you began your career at Hermès? 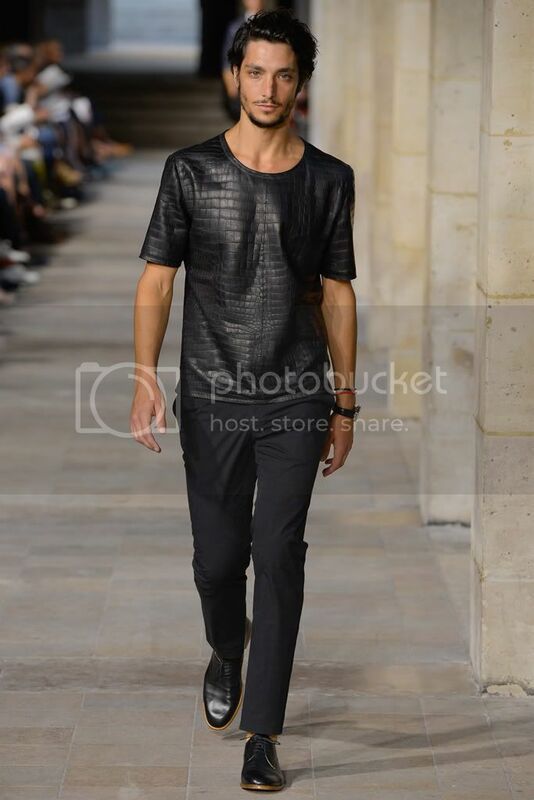 Véronique Nichanian: Today, men are more and more confident and dare to express themselves with their clothing. I've learned that men have to be in harmony with themselves to choose their style. It's really about personality. ESQ: What's the biggest misconception that men have about dressing themselves? VN: When people think they have to follow trends, or fashion in general. They have to free themselves from any fashion dictate. ESQ: What are the three items every man should have in his closet? VN: A black cashmere sweater, a gray flannel suit, and a white poplin shirt. But a fourth would be an amazing leather piece — like a jacket, for instance. ESQ: Tell us a little bit about the Hermès made-to-measure and bespoke programs. VN: Customers can come and speak with a tailor about the fit they like. Then the customer will be able to choose from 5,000 fabrics and have a suit made to their individual specifications. It takes 30 measurements and 70 to 80 hours of work in the atelier to have a suit made. What's special about Hermès, though, is that you can also ask for custom leather and knit pieces, too. We can even create something in a specific color at a customer's request. ESQ: How do you, as a woman, approach designing for men? VN: Being a man or a woman isn't the point. It really depends on one's own personality and sensitivity. After all, we speak the same language and live the same way. I mean, would you ask this of all these men that design for women ? ESQ: What advice do you have for men today, in terms of dressing? VN: Trust yourself... and be smart and charming. ESQ: And finally: your thoughts on the future of men's-wear? VN: I think that there's is a lot to be done, still. "like croco chiffon that transforms matte crocodile into a soft fabric suitable for a shirt or T-shirt"